A bit of water never hurt nobody! 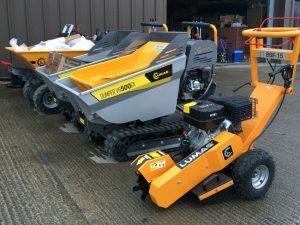 If you’re thinking of possibly becoming a Lumag Dealer, you may find it useful to know that our sales don’t seem to be affected by the weather. All of our machines, whether they’re built on big chunky tyres, or purpose-built tracks, are capable of getting the job done in all terrain. Whilst sales of lawn mowers, strimmers etc. may start to fall over the Winter months, our tools can prove what they’re made of all year round! Check out the Lumag fleet enjoying the last of the July rain earlier on today in the picture below. « Our trencher is meaner than your trencher!